Sen. Maria Cantwell (D-Wash.) and Sen. Ron Wyden (D-Ore.) greet Lindy Suhr. The 37-year-old has a terminal genetic disorder that requires costly care. Lindy Suhr has a terminal genetic disorder that causes her motor skills to deteriorate, her cognitive ability to suffer and life-threatening seizures. The 37-year-old takes seven medications, sees five specialists, and undergoes regular physical therapy. Her father has a genetic heart disease. Her mother has diabetes and hypertension that she says are genetic. Without the Affordable Care Act’s requirement that insurers cover patients with preexisting conditions, the Suhrs fear their cost of care would become unmanageable. 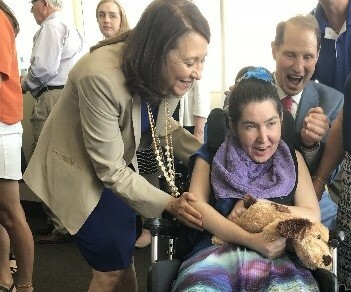 Sen. Ron Wyden, D-Ore., and Sen. Maria Cantwell, D-Wash., pledged on Friday to fight for the rights of patients like the Suhrs to buy health insurance. “We must protect citizens of our country with preexisting conditions from being rolled back to times when their health care cost more just because of that condition,” Cantwell said at a press conference at Oregon Health & Science University. The event came three weeks after U.S. Attorney General Jeff Sessions said that the Trump Administration would not defend the Affordable Care Act against a lawsuit filed by Texas and 19 other and 20 states. If the lawsuit prevails, it would find unconstitutional rules that ban insurance companies from denying coverage to people with preexisting conditions. As many as 130 million American under age 65 have preexisting conditions, according to the Department of Health and Human Services. The Kaiser Family Foundation estimated that without the existing ACA policy, more than one in four adults under 65 could be denied health insurance based on preexisting conditions. Wyden called President Trump’s Supreme Court nominee Judge Brett Kavanaugh “hostile” toward the ACA and argued that both Trump and Kavanaugh have demonstrated a desire to dismantle protections for patients who’ve purchased insurance through the exchange. Dr. Jennifer DeVoe, an OHSU researcher, described Friday how she’s seen firsthand the impact of insurance companies denying her patients coverage due to preexisting conditions. She had a patient in 2007 lose his job and his employer-sponsored insurance due to complications from a heart attack. When he tried to get new insurance, he was denied because of his heart condition. His condition worsened over the three years that he remained uninsured until he struggled to walk and breathe. He died of a fatal stroke shortly after turning 65 and becoming eligible for Medicare coverage. DeVoe had another patient with breast cancer who put off seeing her because she was afraid that DeVoe would diagnose her with a preexisting condition that would prevent her from getting health insurance. The states’ lawsuit heats up the debate over the Affordable Care Act in the runup to mid-term elections. U.S. District Judge Reed O’Connor will hear the case. An appointee of President George W. Bush, O’Connor has ruled against other parts of the ACA in the past few years.